Start by washing your potatoes, make sure your scrub off any dirt as you will be leaving on the skins. The slices your potatoes using a mandolin slicer or the slicing blade or your food processor. 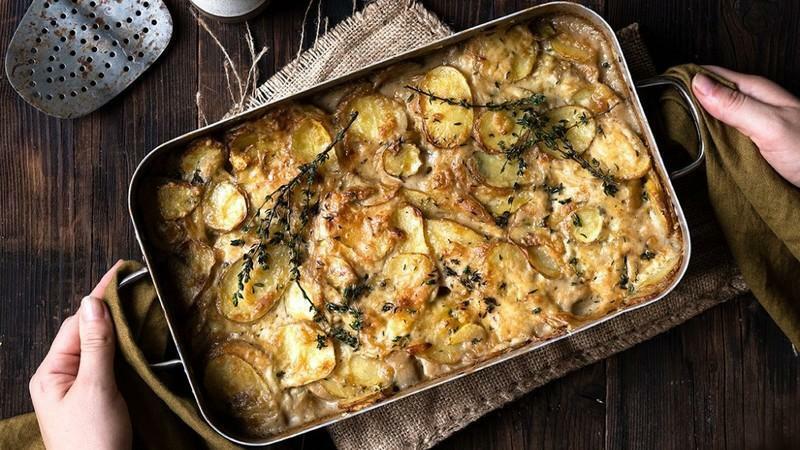 Place all of the potatoes in a large oven proof form. Heat a skillet over medium heat and add 2 tbsp of the olive oil. Finely chop your onion and saute for about 2 minutes. Slice the garlic and remove the thyme leaves from the stems and add to the onions, saute for about 2 further minutes and them add to the potatoes. Heat a clean skillet and add the remaining 4 tbsp of olive oil. Make sure the oil is very hot, so once you add the flour it start to sizzle. Add the flour and then stir well until flour and oil form a paste. Then add the coconut milk and stir well, next add the almond or cashew milk. Stir until you can feel the milk start to thicken. Once the milk start to thicken, add the lemon zest, nutritional yeast and salt and pepper. Taste to make sure the sauce is seasoned well, adjust salt, pepper or nutritional yeast if necessary. Pour about 3/4 of the sauce over the potatoes and then mix well. You want the sauce to be evenly covering the potatoes. Pour the remaining sauce on top of the potatoes. Then place the form into the oven and bake for about 40 minutes.